Binary art takes shape in experiments like Brion Gysin’s Dreamachine (circa 1960). The Dreamachine is a cylindrical modulating light that rapidly flickers through a perforated pattern and causes one to enter a dream-like hallucinogenic state. The shape of Gysin’s design is similiar to Fillippo Dell’Orto’s elongated Hal 9003, whichÂ combinesÂ solid form with transparency and illumination, creating radical a form that pleases both the eyes and the senses. The theory that Progress is a stepping stone toward some elevated plane of existence is not necessarily a time based, linear notion. The chaos theory proves (to the extent that it is derived) the multifaceted array of the “seemingly” random order of time. The generation of a fractal is one way to describe this theory in motion. Things change yet nothing changes — simultaneously. He and many other artists of this era have formed a valid argument against the notion of Progress as linear. 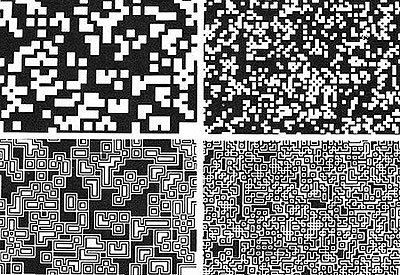 This is evident in their experimentation with geometry and patterns generated by early computer programs. Have you ever wondered what exists beyond the scope of human intelligence? Is there such a thing as an original idea? 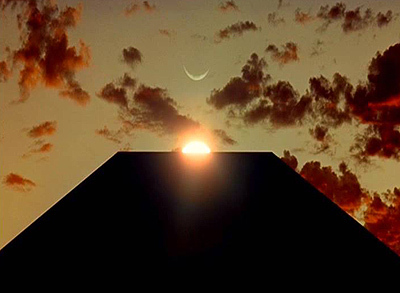 What ever happened to idealistic vision of â€œThe Futureâ€ promised by some of the great minds of the 20th Century? Welcome to sixdifferentways.com, your portal to Space Age thought, design, technology, and Beyond! The intent of this blog is to promote forward thinking and innovation within a positive environment. We will discuss the contributions, past and present, that have propelled the evolution from Modernism through Post Modernism to our current cultural climate. Todayâ€™s artist is Finnish designer Eero Aarnio. Aarnioâ€™s â€œBall Chairâ€ (1963) is a fiberglass semisphere with cushioned center on a rotating base. Aarnioâ€™s creation has been described a â€œroom within a roomâ€ because of itâ€™s unconventional shape and cozy atmosphere. 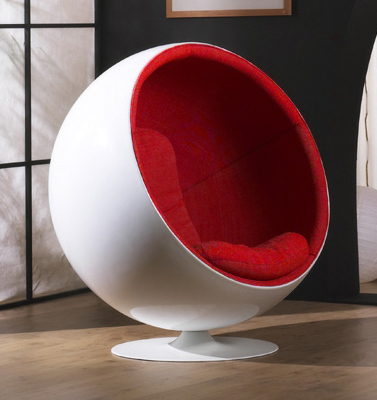 The conception of Aarnioâ€™s â€œBall Chairâ€ escalated the trend of womb-like interiors in Modern furniture.